‘MORALE BOOSTER NO. 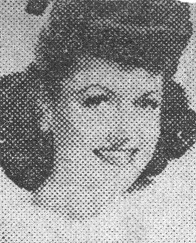 1’ Lovely actress Angela Greene strikes up one of her best morale-boosting poses for the boys of the 758th Railway Shop Battalion of the I-B Theater, who recently named her "Morale Booster No. 1." See what they mean? Roundup Staff Article The War Department announ- ced this week that the "interim score" of 85 points or better for discharge eligibility will temporarily remain unchanged, pending release of an estimated 800,000 men who are non-essential. Secretary of War Henry L. Stimson stated that the "85 score" will be revised at a later date to allow release of 700,000 additional personnel. He said 235,000 men already have been discharged since May 12. Stimson stated that the War Department plans to discharge an estimated 2,000,000 men and women by June 1, 1946. The secretary of War broke the figures down into the following categories: THREE CATEGORIES (1) Non-essential men with 85 points or better, whose number will total 800,000 (This includes approximately 5,000 WAC's whose score remains at 44). (2) Discharges for illness or other reasons not connected with the point score: 500,000 (This is expected to include approximately 6,000 WAC's whose husbands have returned to civilian life). (3) Discharges under the "newly-computed" score, which, according to United Press, will be announced soon after the first of the year; 700,000. This "newly-computed" score will give credit for points earned after May 12. The War Department stated that no critical score will be announced for officers, but estimated that 100,000 will be discharged by June 1 of next year. Individual scores for officers will also be re-computed to include credits earned after May 12. Stimson stated the Army will continue to give consideration to length of service overseas and hazardous duty but warned that the element of military necessity will play a much greater part in their case than in that of enlisted men. AIR CORPS STATUS There was no indication as to whether the "newly-computed" score will remain the same for the Air Corps as for the Ground and Service Forces. It had previously been stated that the Air Corps would have a different "critical" score than the Ground and Service Forces. On behalf of the Air Corps, Maj. Gen. Frederick L. Anderson revealed in a special radio broadcast that 80 percent of the officers and enlisted men of the USAAF who served in the ETO and the Mediterranean areas will be assigned duty in the U.S. He said that men who have not yet seen combat overseas will be the principal source of personnel for expanded operations of the AAF in the Pacific. Anderson refuted speculation that the AAF faces a "smaller job" than before the surrender of Germany and, accordingly, will discharge large numbers of men. He pointed out the strength of the AAF on V-E Day was 2,300,000 for a two-front war and stated the AAF will still need 2,130,000 against Japan. 2,000,000 MAXIMUM Stimson promised that status will remain unaffected for eligible men with 85 points or better who have not been discharged by the time the "newly-computed" score is announced. Pointing out that the 2,000,000 discharge figure was the maximum that could be released on the basis of discussion with Gen. Douglas MacArthur, Stimson stated that discharge of veteran soldiers in this manner is unprecedented in wartime. "Only in a free country such as the U.S. would the Army give such consideration to the individual and his welfare in time of war," the Secretary of War declared. Roundup Staff Article The Army point system for discharges was attacked as a "mathematical monstrosity created to confuse and bewilder" in a Senate speech this week by Sen. Edwin C. Johnson (D-Colo.), ranking Democrat of the powerful Military Affairs Committee and head of the Veterans Affairs sub-committee of the Senate Finance Committee. Johnson, assailing the Army as a Frankenstein that must be checked by Congress, charged that the U.S. could not possibly deploy 7,000,000 or 8,000,000 troops against Japan and that even by the end of 1946 the maximum that could be transported and supplied would be 3,000,000. Johnson stated, "We have three times as many generals, colonels, and lieutenant-colonels as we can use against Japan." He declared that while the question "of busting some of our great generals back to colonels and majors is a delicate one, but we cannot afford to have an Army twice as large as our requirements to save somebody's face." Replying to the Johnson blast, Secretary of War Henry L. Stimson protested that the whole discharge program had been gone over with Gen. Douglas MacArthur and his commanders. He said the maximum discharge possible, without endangering operations by loss of experienced combat leaders, is being carried out. Stimson stated that under the present and future point systems 1,500,000 will have been discharged by June 1, 1946. He said an additional 500,000 will be released for illness and other reasons not connected with the point system, making a 2,000,000 total. He stated that in the meantime new inductions (estimated at 100,000 monthly) will maintain Army strength at 6,968,000. These inductions will make possible discharge of an additional 700,000 in the future under a "somewhat" revised point system "early next year," the Secretary said. Johnson replied to Stimson the next day in letter form, going into statistics allegedly proving that the U.S. could not possibly deploy more than 3,000,000 men against Japan by the end of 1946. JOHNSON REPLIES The Senator figured that if 4,000 men a day are transported that 2,000,000 new soldiers will have reached the front by Jan. 1, 1947. But he said that attrition from all sources will cost 40,000 per month, which will withdraw 700,000, leaving about 3,000,000 men in the Pacific by the first of 1947. The Senator asked "if in truth my calculations are not optimistic?" He told Stimson "no mumble-jumble answer will do this time." Johnson also charged that under what he termed the "revolving" plan fully 30 percent of the men now in the South Pacific are due for replacement, many having served three years abroad. He warned that unless the Army revises its discharge figures "millions of bitter men will be milling around in camps in the U.S." THOMAS DISAGREES Sen. Elbert D. Thomas, chairman of the Senate Military Affairs Committee, disagreed with Johnson's stand and attacked critics of the Army's size. He said, "The Army really started something when the first man was let out as surplus. Now there's a general rush to collapse the Armed Forces." From the powerful Military Affairs Committee in the House came another blast at the Army this week in the form of a charge by Chairman Andrew May (D-Ky.) that "promotion seems to be a customary reward of brutality." Reporting on his committee's investigation of reported beatings of G.I. prisoners at Lincoln Field, Neb., Air Base, May charged that no action had been taken against the persons responsible until Congress began investigating. Then he revealed that two officers and four prison guards were acquitted and another officer had not only been tried but even promoted to captain. May said evidence clearly showed that one Pvt. Warren C. Miller of Pennsylvania had been tried and imprisoned for failing to obey an order from a corporal to take his hands out of his pockets. May charged that guard Pvt. Albert L. Winkle, right under the eyes of Capt. Leonard Dunn, Provost Marshal and Lt. Stanley K. Jones, prison officer, had beaten Miller with a club because he wasn't breaking rocks fast enough on his guardhouse detail. After the beating, Miller went back to his rock breaking job. According to May, the Provost Marshal was still dissatisfied; so Winkle again went to work with his club on the helpless prisoner, who then had to be carried to the hospital. May said Winkle had given evidence that he had no choice except to obey orders. May said Dunn had never been tried, but instead was made a captain. He said Jones, along with Dunn's successor, Capt. Anthony Parisi, had been acquitted at courts martial, along with four prison guards, including Winkle. One staff sergeant, Odus L. West, was sentenced to two years for mistreating prisoners. May concluded, "Every effort should be made to keep the confidence and morale of the Armed Forces at the highest level, but the effect of the acquittals in the light of all that is known is hardly conducive to the attainment of such a goal." OKINAWA (ANS) - They almost had to call out the Dumbo rescue planes this week. Gen. Joseph W. Stilwell's campaign hat was lost at sea. The hat, worn by the general for more than 29 years, blew out of a Cub observation plane over the ocean off Okinawa. Stilwell like to ride with the windows open. "Do you want to go down and get it?" asked Sgt. Lyle W. White, the pilot. "I'd sure like to go down there and rescue my old friend," the 10th Army Commander said wistfully. When the plane returned to the landing field, Stilwell offered a $25 reward for the return of the hat and hundreds of soldiers fanned out in a wide hunt by air and sea. After four hours, the prize was spotted 200 yards off shore by Cpl. Edward P. Donahue, of Cleveland, O.
Donahue waded in the water up to his armpits, but he made it. He handed the hat, dripping wet, to the general and collected the reward. Stilwell squeezed out the salt water and hung up his old friend to dry. STRICTLY G.I. By Ehret "Let's button that pocket there, soldier, if you want to keep that stripe. Cackle cackle cackle." Dear Gertrood. 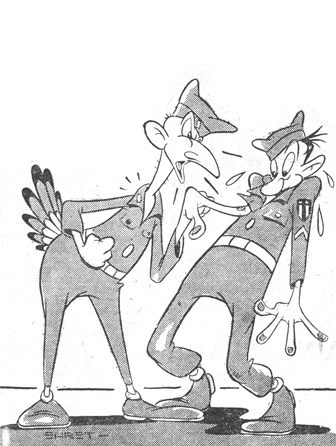 Cartoon letters by Sgt. Wendell Ehret. With an introduction by Gertrude Rubin. 128 pages. Published by Robert M. McBride & Company, New York. As American as an American in India is Dear Gertrood, new book of "cartoon letters" by Roundup's Sgt. Wendell Ehret, just published in New York by Robert McBride and Company, a copy of which arrived in the Roundup office this week. Dear Gertrood is a new book in the history of publishing of American graphic humor. There never has been anything like it before. It's the letter of an American G.I. (Sgt. Ehret) to his girlfriend (Miss Rubin), but letters like you've never seen before. When he first came to India's shore, Ehret started mailing letters to the girl he met back in Brooklyn just after he got in the Army - but what letters! Ehret didn't make much use of the Phonician alphabet. He wrote letters by drawing cartoons. At first the censors thought he was a Japanese spy or he was trying to get out of the Army by the Section Eight route, but they soon caught on. Since then they've had to bury three unit censors who killed themselves laughing at the graphic missives to Miss Rubin. The editors of Look magazine got a glimpse at some of the letters and published them. Came requests from soldier and civilian for more. The book is the answer to that request. Ehret, a tall, soft-spoken, absolutely modest cartoonist, was an artist for animated movies before getting in the Army. Born on a ranch in Colorado, he knows how to milk cows and draw. He decided to take up the brush instead of the udder for his life's livelihood. Soon after getting into the Army, Ehret was stationed in New York and there at a canteen, he met Miss Rubin, a topaz-eyed model, the girl from Brooklyn with the bow in her hair. How he managed to meet her after fighting off his timidity and various wolves in human form and uniform is told in a spontaneous talent for making pictures do for words. 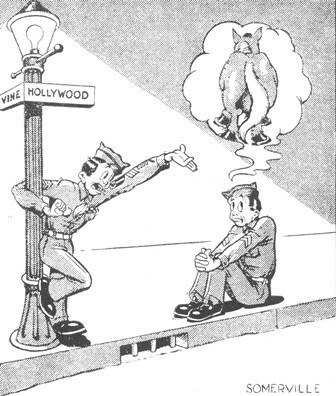 The drawings are animation style, familiar to Roundup's readers of Strictly G.I. Ehret has shown a genius for turning the simple, everyday things which might be said in a letter into humorous pictorial form. We're proud of our boy. - W.B.S. GROUNDED Grounded after two missions over Tokyo and numerous trips over The Hump, Gertie, sloth bear from Calcutta, finds beer to her liking. 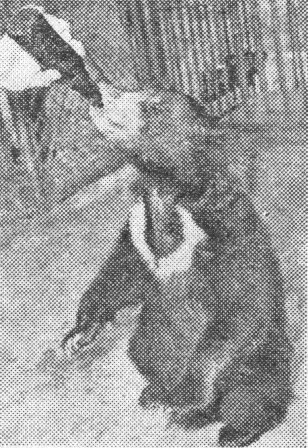 The bear was donated to a San Francisco zoo by Capt. Hap W. Good, B-29 pilot. CALCUTTA - Sgt. Ronald M. Roy, Base Section personnel clerk and veteran of 22 months in the India-Burma Theater, has been selected to attend the United States Military Academy at West Point, it was announced this week by the Theater Commander, Lt. Gen. R. A. Wheeler. A pre-law student at Colby College, Waterville, Me., before entering the Army in 1943, Roy will depart for the States soon to begin preparatory training. He was chosen from a large group of applicants representing the entire Theater. Armed Forces Radio Station VU2ZV at Chabua, one of the two most powerful outlets in the I-B Theater, is now identified during station breaks as "Humidity House, at the crossroads of Asia," Capt. Frank B. Goss, officer in charge, announced this week. With new master control equipment installed and operating 18 hours daily, the new studios are located near the intersection of the India, Tibet, Burma and China borders. Staff of Humidity House includes: Sgts. Mack Fuller and Frank Soares; and Cpls. Jay Jackson, Eugene Sayet, Ray Owens, and Pat Bishop. H.Q. ENGINEER DISTRICT NO. 12 - Sgt. Roy E. Grabenauer and T/5 Robert P. Gallow have been awarded the Soldier's Medal for their "courage and bravery" in combatting a recent pipeline fire. When fire broke out in a gasoline storage area and the burning fuel swept down a nearby stream, threatening large quantities of stored high octane gas, Grabenauer and Gallow drove a bulldozer into the face of the blaze and succeeded in damming the stream, while the fire was smothered at the point of origin. Their action, said the citation, prevented a disaster which would have seriously affected the flow of gasoline to China. MILITARY ‘SWEET CHARIOT’ Capt. Russell Deitch, chaplain of the India-Burma Air Service Command who spends most of his time wandering about Burma jungles visiting isolated outposts, stands beside his "Sweet Chariot." On the side of the jeep are painted 11 churches, indicating the number of "missions" the chaplain has made to small jungle-bound detachments. AIR SERVICE COMMAND BASE, BURMA - In the teak wood forests and palm jungles of Northern Burma and along the rolling hills, Sweet Chariot has come to be known as a "mobile pulpit." 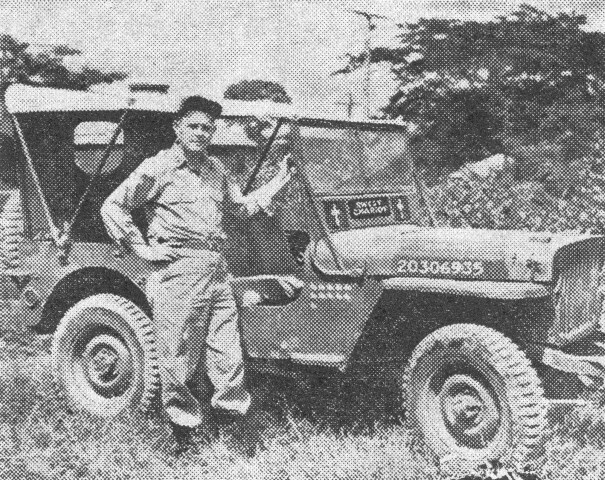 It is Chaplain Russell A. Deitch's jeep and its sides are studded with stenciled "churches," indicating the number of missions he has made to hold services in remote outposts and along the Stilwell Road for isolated detachments. The padre considers these detachments as "my boys." And so during the 19 months he has been in India and Burma, he has kept Sweet Chariot rolling along the dusty trails during the heat spells and the quagmired roads during the monsoon to visit them wherever they are located. When an Air Service Group under Lt. Col. J. P. Hines moved from India into Burma the change operation was accomplished mostly by air. This immediately posed a problem for Chaplain Deitch. Sweet Chariot would have to remain behind, but the padre shook his head negatively. He had his church organ and homemade pulpit to take along, so he loaded them in a trailer, hooked them to the jeep - and began the long journey of more than a thousand miles into the heart of Burma over unfinished roads which just a short time before had been footpaths. Along the way, he met troop detachments laying the pipeline into China and many of them had not seen a chaplain for many months. With the organ and a pulpit, they had comparatively fashionable services in the jungle. The Japs were still pouring out a metal monsoon outside of Mandalay when the padre arrived at the famous Kipling city, now reduced to ruins. "I didn't know it at the time," he said, "but the town was still infested with snipers. Our party drove right in behind the British sniper-hunters on motorcycles." One service in particular is indelible in the chaplain's memory. He was flying in a C-47 at 5,000 feet with nurses, Red Cross workers and soldiers as fellow passengers. "While we flew over the jungles of Assam," Deitch relates, "we sang lustily from hymn books I had passed out." Prior to his joining the armed forces, Deitch lived with his wife, Dorothy, and two children, Jeanne and David, at Martin's Ferry, O., and was pastor of the First Christian Church in Dawson Springs, Ky.
CALCUTTA - A G.I. Theater Guild has been developed to serve troops in the Calcutta area, with several members with past theatrical experience forming the nucleus of the organization, which plans to produce outstanding Broadway plays. The initial effort of the Guild is the current play, Three Men on a Horse. This play was directed by S/Sgt. Dan Chugerman, who directed the same play for the Hollywood Victory Committee. He rehearsed his cast for six weeks before opening the play here. Pfc. Dan Tobin, who played with Katherine Hepburn in the stage version of Philadelphia Story, and in the movie Woman of the Year, is another veteran of the footlights. Two Red Cross girls, who have been loaned to the Guild, are Miss Jackie Baxter and Miss Mary Hoover, who will form the feminine talent for future plays. Miss Baxter has played with various stock companies on the American stage while Miss Hoover is a graduate of the Julliard School of Music. Other members of the Three Men on a Horse cast are Cpl. Wally Schwartz, who soloed with top bands in the States; Larry Daniels, former night club M/C and S/Sgt. Jesse Sincere, the poor man's Barrymore. Herewith is shown a page from a popular gaming catalogue, proving that gambling is a big business. There are plenty of gambling supply houses making good cash in the sale of crooked accessories to G.I. sharpies. 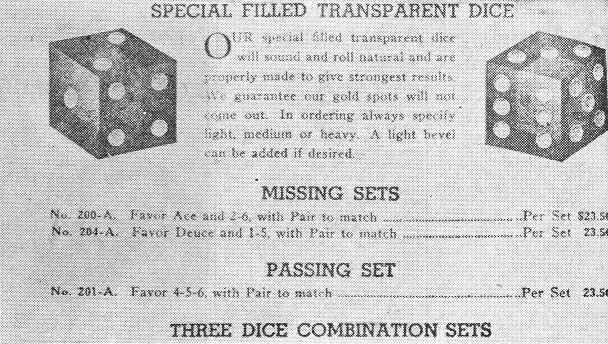 Below right are shown dice that feature only 5's, 3's and 1's. To the average player it would seem impossible to slip these into a game, but it does happen. With the aid of a mirror, the five sides can be seen, and there is another 1 on the bottom. Probably the most popular game in the Army is rattling the bones, riding the galloping dominoes or just plain shooting craps. The footlocker with the Army blanket over it probably sees more cash transactions on pay night than the Finance office does in a week. And there are as many crooked dice games as honest ones in the Army. The old Army blanket gives gamblers in uniform their best set-up for the use of crooked dice - the nap of the blanket helping loaded dice to do their stuff. "Shapes" such as "6-1 flats"
are not used too often, for a sharp-eyed G.I. can spot them. Like dominoes, the "shapes" have flat sides opposite the 6 and 1, thereby increasing the odds on the 6 and 1 coming up. The difference in size is usually only about 20/1000th of an inch, which makes it doubly hard to detect. Then there are the "rounders" which give the dice a tendency to roll off certain numbers on to other combinations. "Capped" dice have rough and smooth sides which makes some slide or tumble. And then the favorite "loaded" dice. Most loaded dice come in sets of three where one die always stays in and the other two are alternated by palming to favor the fader or the shooter. The riskiest method is to substitute "tops" with only three numbers on the six sides. To prevent detection these dice can only be slipped in and out of a game with a big crowd to distract from the switch. Here is an example of what to watch out for in a crooked dice game. The difference in size of the above "matched" set of "6-1 flats" is not exaggerated. 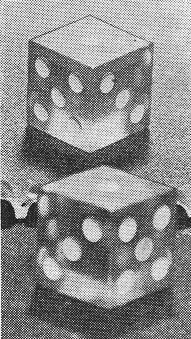 These dice were picked out of an Army dice game and are designed to bring up a 7 or craps with a 6-1 combination. These can usually be spotted by the fact that a 6 appears almost every roll. They are rolled by holding the dice by two corners between the thumb and first finger. Spin the dice. Loaded ones will spin back to a certain combination. Gambling houses will supply all kinds of dice - for a price. And one midwest concern brazenly puts out a special booklet with advice on purchasing, and mailing to APO's. The most clever dice man doesn't need loaded or shaped dice. He specializes in the "Greek shot," wherein the bottom die is held tightly in the hand with the little finger when shaking the dice. In throwing, the crook then slides out the bottom die with the number he wants face upwards, while the other rolls free. Naturally the odds are terrifically in the shooter's favor if he can control one of the ivories. A dead giveaway on this practice is that the thrower uses a snap pass with his hand close to the table. Let me say in conclusion that gambling doesn't pay off like War Bonds. Unless you are playing cards or rolling dice with known "honest" friends, your chances of getting in an honest game are few and far between. ALONG THE BURMA ROAD (CHINA) - Upon patient questioning, Molly will admit with a sad toss of her head that the life of an adventuress isn't always an easy one. Eight times wounded in battle, long-eared Molly has come a long way for a lady since she joined the Army six years ago. When I met her high in the tumbled hills of Yunnan, she was but a shadow of the belle who once had frolicked in the rolling green pastures of Missouri. Her gaunt torso was ribboned with the stark pattern of her ribs. Protruding vertebrae along her broad back suggested a bas-relief map of the Himalayas. Her shabby brown coat was ragged, dusty and travel-worn. And small wonder, Molly's lifetime itinerary reads like a Haliburton travelogue: Missouri to Texas; Texas to Panama; Panama to Colorado; Colorado to New Orleans; New Orleans to Calcutta; Calcutta to Ledo; Ledo to Myitkyina; Myitkyina to Lashio; Lashio to Myitkyina. And now a new chapter to Molly's saga - Myitkyina to Kunming - is being written. And after Kunming? Molly shakes her head with sophisticated boredom when considering her future, and her shrewd, brown eyes seem to say wearily, "Kismet, Kismet." Molly is Empress Dowager of the most valuable herd of mules that ever kicked their collective heels high in the air with perverse abandon. For Molly and her fellow Missouri blue-bloods - all of them Quartermaster Pack Troop and Mule Pack Artillery veterans of the Burma jungle campaigns - have, during their wide and extensive travels, accumulated an estimated value of $5,000 each. The $5,000 price tag is purely an intrinsic figure, based on what Uncle Sam has paid to bring each mule 14,000 miles around the world. The story of the year-long mission of the men and mules of the Quartermaster and Field Artillery pack outfits constitutes one of the great records of endurance to come out of this war. 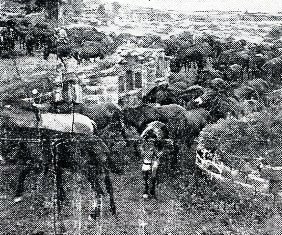 Tired veterans of the Burma campaigns, these mules of a Field Artillery Pack outfit are given a well-deserved "break" during their march to Kunming to graze in a Chinese cemetery. In China, the mules will be turned over to the Chinese armies. Lt. B. F. Kidd, a cattle rancher in Menard, Tex., before joining the Army and becoming company commander of a QM pack unit, estimated that by the time his men reach Kunming they will have walked 2,300 miles since leaving the United States in August 1944. The young, wiry lieutenant, seated in a dingy Chinese restaurant outside the ancient walled town of Hsiakwan on the Burma Road, grinned and modified his statement, "Of course," he said, "we didn't march the mules across the ocean. We started walking up The Road with 'em from Ledo last October." Kidd's muleskinners - tired, dusty men bronzed by long months on the trail - laughed loudly, Sgt. Ernie Mutch - who later admitted he had gone into the rodeo games "when my Old Man in Browning, Mont., got tired of feedin' me - poured a shot of Vodka from a tall bottle and said, "Maybe we didn't march them goddamn critters across the ocean, but I'll be damned of they'll ever get me and a bunch of mules together on the same boat again. Once was enough." Pfc. Raymond J. Coulombe of Fall River, Mass., who had ridden Molly since she recovered from shrapnel wounds received when Mars Task Force - to which both the QM and Artillery pack outfits were attached - engaged the Japs in the Battle of Hosi Valley during the Central Burma campaign, came to the defense of the mules. "I don't know. The mules weren't too bad to handle on the boat," he said. "Maybe not, but when it comes to eatin' and sleepin' with 'em, I lose my affection damn fast," Mutch said. T/Sgt. Luke A. Reed, a grizzled cowpuncher from Ringling, Okla., broke into the conversation. "Say what you want, these mules have got plenty of savvy," he said. "Take my mule Grandpa...." Everyone groaned, and across the table T/5 William E. Sweeney of El Monte, Calif., said, "Hell, don't start in on that old goat again." But reed continued. grandpa, O soon learned, was a battle-wise graybeard that had marched up into Burma with Merrill's Marauders. A veteran of the entire North and Central Burma campaigns, with an insatiable hunger for K-Ration cheese and C-Ration crackers, Grandpa had been wounded seven times. "Still the best mules in the Army, though," Reed concluded. Kidd's outfit is but one of a series of Quartermaster and Artillery mule pack units stretched along the Burma Road for nearly 200 miles, all moving toward Kunming. The outfits have been on The Road since leaving Myitkyina in late May. The first of the mules, the men on the road estimate, will arrive in Kunming by mid-August. Actually, the trek to Kunming began in Ledo last October when the mule-skinners unloaded the mules from boxcars after a 700-mile train ride from the port of Calcutta and headed up the Ledo Road into Burma. At Myitkyina, after struggling for three weeks through the monsoon-flooded Mogaung Valley, the mule pack outfits joined the Mars Task Force. By Christmas Day the mule-skinners had moved down into Central Burma's jungled hill country with the Men of Mars. Christmas packages and "Fixin's" for their holiday meal were delivered by air-drop. The pack outfits followed dim, narrow jungle trails, carrying rations, ammunition and artillery to maintain the campaign against the Japs over wild terrain. The QM units operated from air-drop fields, hauling the rations and ammo up to the front lines. The Artillery units carried the heavy weapons of war up and down steep mountains matted with vegetation, keeping pace with the ever-retreating Japs. After a number of skirmishes and major battles at Tonkwa, Nam Paka and Hosi Valley - engagements which resulted in casualties among both the men and the mules - Mars entered Lashio in March with the Chinese 30th and 38th Divisions, ending the Central Burma campaign. The mule outfits had been marching over some of the toughest terrain in the world for nearly seven months by the time the campaign ended. The bivouacked in Lashio, hoping for a much-deserved rest. But before they had time to trim their bunions they were ordered to report back to Myitkyina. Another six weeks on The Road. And at Myitkyina they were assigned the job of delivering the mules to Kunming, approximately 800 miles away. The mule outfits left Myitkyina at intervals of two and three days to prevent overcrowding of trails and watering and feeding facilities. The going was the roughest the men and mules had yet faced, particularly through the Tengchung cut-off where they followed the ancient stone caravan trail used by Marco Polo centuries ago. Men lived on 10-in-1 and K-rations for more than a month. Rain-swollen mountain rivers had to be forded and in places the mud was knee-deep. Men were stricken with dysentery, malaria and other jungle fevers. On one outfit three men died of the dread mite typhus. Lt. Dave Short's Mule Pack Artillery outfit, which I found bivouacked among the crumbling stone tombs of an old Chinese cemetery near Tsuyung presented a vivid picture of what all the pack outfits had been through since leaving Burma's fertile Irrawaddy River Valley in May and pushing up through the Tengchung cut-off toward the monsoon-shrouded Himalayas and the Burma Road. "I've been wrestling mules since I was knee-high to a grasshopper," Short told me. "But these last two months have been the toughest in my life. Just plain hell." The young St. Ignatius, Mont., rancher settled back against a grass-covered mound that marked the last resting place for some long-dead Chinese and said, "Ain't that right, men?" The group of "skinners" who sprawled nearby on the ground nodded, and Short continued. "We were 35 days coming through the cut-off from Myitkyina to Lungling on the Burma Road. This Marco Polo trail we followed was steep and the rock paving was slick as ice. Sometimes we had to hang on to the mules' tails to get up bad inclines. We ate 10-in-1's until we couldn't look a can of dehydrated rice and meat or a can of English style stew in the face. The last nine days on the trail we went without cigarettes, which didn't improve our tempers a damn bit." S/Sgt. John Wamlsey of Austin, Tex., exploded. "By god, I was never so hungry before in my life. I used to have nightmares dreaming about rare two-inch steaks." Then he chuckled, "Remember the day Weaver shot two crows and roasted them for supper?" S/Sgt. Floyd J. Weaver of Brown City, Mich., snorted, "Ya-damned right. And they tasted better than the lousy 10-in-1's. Incidentally, Wamlsey, did you ever catch that fat sparrow you were chasing around camp one night? Everybody roared with laughter. Lt. Claire H. Burnham of Belle Plaine, Ia., veterinarian attached to Short's outfit, spoke up. "Sure, it was tough going," he said. "And the mules had a rough time of it, too." The vet then explained that feed for the animals had been a big problem. Very little hay or straw had been obtainable in China, resulting in a diet of sparse grazing pasture supplemented by dried beans and young bamboo sprouts. "That's a diet which sure as hell isn't going to put any meat on the mules," he said. "They've done well to stay in as good a condition as they are." "Shrapnel," eight times wounded veteran mule of the Burma wars, reports for dental inspection by T/4 John I. Holler during the long trek to Kunming. Mules such as Shrapnel are valued at $5,000. Burnham went on to say that water for the animals also was a problem. "Most of the time the only watering facilities for the mules has been muddy rice paddy water," he said. After branching off the Marco Polo Trail onto the Burma Road, the men's diet picked up considerably. Once on The Road, each unit was equipped with a mess truck which went ahead of the men and mules to the next bivouac area to prepare hot meals. Sgt. Lewis A. Nehaus of Murphysboro, Ill., Short's mess sergeant, revealed that as soon as the pack outfits hit the Burma Road they were supplied with B-Rations bolstered by fresh eggs and vegetables purchased along the way. "But I sure was ashamed to feed the men 10-in-1's day after day along the trail. Wrestling mules on that slim diet ain't no joke," he recalled. "How about PX rations? I asked. "That's a laugh," S/Sgt. Richard Seibel of St. Louis, Mo., the outfit's pack master, said. "We've only got one ration since we left Burma - at Yunnanyi, when we layed over there three days." Short chimed in: "Yeah, and we got that only because we were out of razor blades." The lieutenant declared that, while camped at Yunnanyi, a colonel came out to inspect their bivouac area and raised hell because none of the men were shaved. "Colonel, we haven't seen a razor blade in three weeks," Short told the inspecting officer. "We haven't had a PX ration in nearly two months." A half day later the outfit was issued PX supplies. As is inevitable at a mule-skinners' bull-session, the talk drifted around to the personalities of the outfit's mules. Every pack company has its pets, like Molly and Grandpa of the QM. Short's men, like the rest of the "skinners," preferred the battle-scarred veterans, bragging about the exploits of a skittish, striped animal named Zebra and a sad-eyed mule call Shrapnel. "Shrapnel's been wounded so many times that whenever she hears a mosquito buzzing she hits the dirt... thinks it's another shell," Corp. Hiram Boone of Marion, Va., said with a sly grin. Long months of independence on the trail have developed a devil-may-care personality among the mule-skinners. There's an air of casual camaraderie among the officers and men that only many hours of mutual hardships could produce. And the men are tough and ready for anything - for you can't march 2,300 miles through tangled jungle and across the Himalayas without becoming tough. Some of the "skinners" - men like Pfc. Richard Keen of Henrietta, Tex., who won the bronc busting championship of Burma in a rodeo held last spring; T/4 John I. Holler of Union Grove, N.C.; T/5 Benton O. Youngren of Buella, Colo., and Pfc. Stanley G. Green of Beaver, Utah - have handled horses and mules all their lives. But many of the now-veteran "skinners" never saw a mule until they received their "neighbors invitation" to participate in the "great experience." Pfc. Elwood J. Sands of Jackson, Mich., drove a beer truck - "And I'd damned well like to be back peddling suds right now," he admits. There are other ex-truck drivers - T/5 Frank Halenda of Scranton, Pa.; Cpl. Chester R. Peelman of Cincinnati, O.; Pfc. 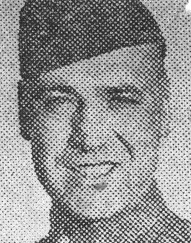 Stanley B. Larson of Minneapolis, Minn., and Pfc. John O. Ball of Hawesville, Ky.
And there are students right out of school, like Pfc. Robert O. Gross of Santa Barbara, Calif.; machine operators like Pvt. George Wolff of Peru, Ill., and even a professional baseball player - S/Sgt. Gene Bergerson of Racine, Wis., who had just gone up to the Yankee farm of Newark in the International League after a "hot" season as a pitcher with Dallas of the Texas league when he was drafted. Bergerson has hauled a battered fielder's glove and catcher mitt and a half-dozen baseballs with him across Burma and into China. "Every time we bivouac I talk somebody into playing catch," he said. "Gotta keep the old salary wing in condition even if I am in the middle of nowhere." :These are the G.I. mule-skinners that today are nearing the end of a 2300-mile trail. They are the war-weary men like T/Sgt. Mike Gallius of East St. Louis, Ill. and Pvt. 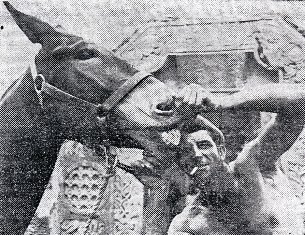 Eufemio Martinez of Trinidad, Colo., who marched mules up into Burma with Merrill's Marauders in February, 1944, and are still on the move. They are men like Pfc. Arne L. Anderson of Chicago and Pfc. Walter Marshall of Long Island, N.Y., still young and eager to see what lies beyond the next hill in China. And, around each campfire along the Burma Road, as they move 15 to 20 miles closer to Kunming each day, the mule-skinners ask themselves: "What's in the cards for us and the mules when we get to the end of this road?" In Kunming, Col. C. I. McClure, commandant of the Chinese Artillery Training Center, holds the answer to that question. The brisk, gray-haired Artillery officer from Ithaca, N.Y., in an interview with the Roundup, revealed that the American mules will be turned over to the new Chinese armies when they reach Kunming. "The mules - 50 of which will be assigned to each battalion - will replace the light Chinese ponies in the transport of pack artillery," the colonel said. But before Molly and Grandpa, Zebra and Shrapnel and all the other expatriates of Missouri move on to the Chinese fighting fronts via rail and truck they will be turned out to pasture for a rest, given medical attention and re-shod. As for the mule-skinners, they will be separated from the mules which they broke and trained three years ago at Camp Carson, Colo., and brought to the jungle wars in Burma, 14,000 miles from home. Here, in Kunming, China, the G.I. "skinners" who helped make American combat history in Burma will become instructors, teaching Chinese soldiers the "gentle art" of mule-skinning as a wartime profession. And, if on some peacetime tomorrow you should happen to wander on the streets of Shanghai or Peiking or even Hong Kong and stumble onto an old, forlorn mule braying a quivering crescendo to the Oriental sky, don't kick the offending animal to one side. It may be Molly sounding a lament for the rolling green pastures of a faraway land. The Army Postal System as operated in the India-Burma Theater is "big business" in the literal sense of the word, with $20,853,763 in money value handled last year in the transportation of everything from sugar reports to what are laughingly called Oriental rugs between here and the States. The Army Post Office is the object of as many rumors as a Red Cross girl. One of the most widely-repeated rumors is that all mail from this Theater will go by boat starting next month. This particular rumor started back in 1942 and is still going strong, oftimes fortified by second looeys who are embittered because their gal has married a master sergeant for his money. Actually there never has been a figment of truth to the rumor and it is no more true now than it was in 1942. All your letters, both incoming and outgoing, are carried by air. Theater Postal Officer, Maj. A. E. Adamson, says he believes this method will continue as long as the Theater exists due to the distance of the States and the time it would take to transport letters by water. The average time for a letter to reach here is a fraction under 11 days. "We use a monthly report as a guide," explained Adamson. "If the average time consumed rises we immediately check and try to find out what is happening. But discounting weather conditions, you can plan to get your mail from the States within 11 days or so. Of course there is bound to be a delay within the Theater on service to isolated units, and sometimes planes just aren't available." We were curious as to whether V-mail use is declining or increasing out here. The APO figures show a definite decline in the use of V-mail, with a big drop in June. Actually you gain no time in writing V-mail from this Theater. In fact, you lose two days in most instances. Since all mail goes by air anyway, your V-mail gains no time there. And you lose one day in Calcutta at the V-mail processing station and another day at the V-station in the States. The Theater Postal Officer also stated that your franked letter marked "free" goes just as fast from here to the States as a letter with an air mail stamp. The average time it takes a parcel to reach you should be between 60 and 75 days. M/Sgt. Robert Marshall, who is in the Theater office and looks forward to being a 30-year man in the civilian mail service once he sheds khaki, says there have been examples of packages reaching the recipients in a little more than 30 days, but that these cases are unusual. One surprising disclosure made by Adamson was the fact that there is more pilfering from Army mails over here than there would be from a comparable number of people in civilian life. However, there has not been a single case of any Army personnel pilfering mail or packages. The stealing has all been done by civil employees and they are gradually being replaced by G.I.'s. One of the biggest trouble spots is at Parbatipur, where the packages are transferred from the broad to narrow gauge railroad. But more guards have been stationed there and Adamson stated this sore spot is being cleared up. The main complaint to the Postal authorities is the limitation of 10 pounds per month to each individual on packages leaving India. Oddly enough, this doesn't apply to Burma, where Army personnel are entitled to send up to 70 pounds a month back home. CALCUTTA - A legendary sports figure, remembered by the current generation through record books and faded newspaper clippings of several decades ago, Indian Jim Thorpe, often described as the all-time greatest of all athletes, made a surprise visit to Calcutta this week. Thorpe, 57 years old, didn't come in with a lot of fanfare, he was on no USO tour. Instead, the man who was the superman of the 1912 Olympic Games at Stockholm, quietly arrived here as a member of the Merchant Marine and when discovered in the City by the Sea he was at work on the docks. When friends urged him to appear for the G.I. 's here, Thorpe obliged. He attended the opening night of the volleyball tourney, made a radio appearance and toured local American hospitals. The veteran athlete got a big thrill from talking with youngsters who had come to regard the early-century hero as a myth, and little expected to see him taking an active part in the war as a Merchant Mariner. Thorpe's visit brought to mind many exploits and tales of the famous American Indian, who entered Carlisle Institute in 1904 and under Glenn (Pop) Warner's direction became the star all-around athlete. Thorpe's career reached a climax in 1912 when he carved a permanent niche in sports history by becoming the first man ever to win the Pentathlon and Decathlon events. Recently, Arthur Daley in his New York Times sports column, stated that the "almost legendary Thorpe was the greatest athlete that America, a land of great athletes, ever produced." Thorpe's athletic skill was exercised in many sports. John McGraw signed him to a Giant baseball contract, he played pro football, helping to organize the National Pro League 25 years ago. He played a low handicap game of golf, bowled with the champions and knew no sport that denied him the right to be classed an expert. But that was long ago. Life hasn't been too kind to Jim Thorpe down through the years and his fortune never matched his skill. Some months ago Jim decided to "get in the war." All the regular military services scoffed at this veteran hero, and only in the Merchant Marine did he find himself acceptable. So, today Thorpe is a happier man - he's back in the game. Roundup Staff Writer Some time ago when one Cpl. Floran Head done in a deer with his pocket knife, we swore off "deer stories," reasoning that the ultimate had been reached. Now we relax that rule to take notice of the recent "deer hunt" by five members of a Jungle Indoctrination unit in Assam. Between fits of retching, caused by too much C-ration and corned willy too frequently, the five huntsmen sat dreaming of venison steaks and recalling the days past when deer fairly over-crowded nearly jungle and could be had for the shooting. Their musings were suddenly interrupted as a 600-pound Sambah deer (first name not given) strolled nonchalantly, almost brazenly, through the front gate, took up a position near the mess hall and stared contemptuously at the open-mouthed G.I.'s. Men of action, the G.I. 's hastily withdrew to the supply room for rifles and ammo, returned to the scene and gave ole Sambah the bizness. There was venison for all and then some. There have been, as you've probably noticed, many stories of brother-brother reunions, cousin-cousin reunions, father-son reunions and now comes an entirely new angle, with M/Sgt. William L. Trimmer flying from Jorhat to Karachi to be reunited with his wife, WAC Pfc. Frances A. Trimmer. The ATC sergeant had last seen his anchor 17 months ago. T/Sgt. Eugene Thompson and T/4 Wesley G. Leino, members of an Aviation Engineer regiment with the I-B Air Service Command, were recently awarded the Legion of Merit for their ingenuity and resourcefulness in making possible the shipment of heavy equipment and vehicles to air-locked bases in Burma. They are credited with the idea of cutting apart bulky equipment which could not be disassembled to fit cargo aircraft and then welding it together when it arrived at its destination. Lt. Col. D. F. Boichoit, Finance Officer of Base Section in Calcutta, reported recently that thrifty G.I. 's in his area, during a recent month, saved more than $150,000 through either War Bonds, Soldier's Deposits or personal bank transactions, proving, if anything, that not all G.I. payrolls are spent on Carew's, women, and Carew's. Celebrating the 38th anniversary of the U.S. Army Air Forces, the India-China Division, Air Transport Command delivered 5,327 manifested tons of cargo to China on Aug. 1, Brig. Gen. William H. Tunner announced this week in a letter to Theater Commander Lt. Gen. R. A. Wheeler. "Throughout the entire 24-hour period, cargo crossed The Hump at the rate of one ton every 15 seconds," Tunner wrote. "This record-breaking production was made possible not only by the all-out effort of this Command, but also by the splendid co-operation furnished by every supporting agency in the Theater." In reply, Wheeler congratulated the ATC commander, writing: "The magnificent achievement of the India-China Division of the ATC is a spectacular and inspiring accomplishment of the primary mission of this theater. "On behalf of the India-Burma Theater, I am happy to extend my congratulations and gratitude to your officers and men." Prisoners for three terror-filled years, two Catholic nuns this week related to the Hump Express, ATC weekly newspaper, the ill treatment they and the Burmese suffered during Japanese occupation. Little Mother Desales, of the Shillong Catholic Mission, acted as spokeswoman for herself and Sister Amerlia as they awaited the daily shuttle plane at Shamshernagar. The Catholic Sisters of the Lasallet Mission, located at Sandoay between Akyab and Rangoon, steadfastly refused to leave Burma in 1942 and courageously faced the ill-disciplined Jap hordes as they surged through the country. The Japanese unceremoniously threw the Sisters into confinement and held them incommunicado. Until the day of their rescue, they daily witnessed scenes of cruelty and barbarism. Suspected of having had a radio transmitter, Mother Mary on three occasions was thrown into jail. She was held in vile quarters for long periods. During one incarceration, she was forced to remain in a filthy cowshed for 10 days on starvation rations. When planes bombed a huge ammo dump at nearby Henzada and British troops pushed south, the Japs thought the Allies too close for comfort and retreated via lorries. For 10 days, hiding in the jungle by day and moving cautiously by night, the Japs fled with the nuns before the advancing Tommies. Finally, the nuns were abandoned at Buthiadaung. A British patrol boat cruising the Irrawaddy learned of their plight from Burmese and dispatched a rescue party. NEW YORK - Toni Seven, whose pinup pictures adorn barracks walls on five continents, especially the India-Burma Theater, blew into Manhattan this week looking for a play in which to make her debut. The beautiful, green-eyed strawberry blonde has never yet appeared on the stage or screen, so we thought it was our duty as Roundup's New York correspondent to buy her a drink and find out what she's like. I'm pleased to report she's wonderful! Despite antics such as a public striptease poker game in Hollywood, arranged by genial, high pressure press agent Russel Birdwell to get her publicity, an hour long interview disclosed she's beautiful, friendly, intelligent, well-educated and rich. When I asked her about the strip poker game in which she and several other starlets recently participated, she grinned shyly and said, "After that, I could do almost anything." She added seriously, "I'm just publicity so far. I don't think it has been in bad taste; but it has been provocative." Then she added, "It's really been a means to an end." Her taste for movies comes naturally since she is the daughter of Harry Millarde, famed film director whose pictures included the early classic, If Winter Comes. Her mother was actress June Caprice, Fox Films answer to Mary Pickford. Her parents died several years ago and she has been living with her grandparents. Birdwell's campaign to get her in the public eye started six months ago when she attacked brass hats in the ETO for ordering G.I. 's to tear down pin-up pictures. Promptly G.I. 's from all over the world began writing in approval and asking for her picture. One of her most devoted contingent of fans was in the India-Burma Theater, whence came hundreds of letters from G.I. 's who read about her in the Roundup. 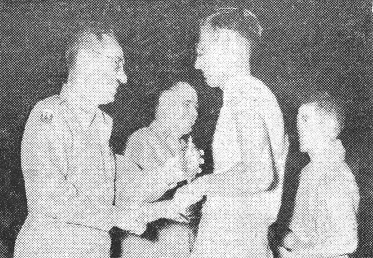 Lt. Gen. R. A. Wheeler, commanding general of India-Burma Theater, presents a trophy to Sidney Cohen, while Brig. Gen. Bob Neyland hands one to Harry Nier after the I-B table tennis tournament finals recently in Calcutta. Cohen and Nier were runners-up in doubles finals. CALCUTTA - Cpl. Herbert Aronson of Chicago, highlighted the India-Burma table tennis tournament last week. He retained his singles crown and teamed with Rex Lantz of Athens, O., to annex the doubles championship as well. Aronson, who is a member of a pipeline outfit here, has given exhibitions at many I-B bases. He outscored Max Godden of Omaha, in the singles finals, 23-21, 21-10, and 21-19, after he and Lantz had topped Harry Nier of Denver, and Sidney Cohen of New York, in the doubles by scores of 21-10, 21-15 and 21-12, with great ease. Aronson and Lantz were both registered in the tourney as representatives from Chabua, Assam. Cups to the winners and runners-up were presented by Lt. Gen. R. A. Wheeler, theater commander, who also gave awards to Calcutta league champions. Two former world champions staged an exhibition on the final night when S/Sgt. Lazlo Bellak, pipeliner, and Pfc. Tibor Hoffman, of the Air Corps, demonstrated the skill which made them world famous as the best in table tennis. S/Sgt. 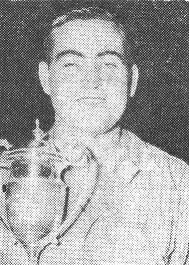 Hal Wagner, I-B tennis king, supervised the tourney, which attracted 240 players and hundreds of spectators to Monsoon Square Garden for the three nights of play. Music was furnished by the 547th AAF band. HQ., 10TH AIR FORCE, INDIA-BURMA - A former FBI agent, Capt. Robert B. Mason, San Diego, Calif., lacks only submarine service in his many war experiences since entering Merchant Marine Officers' Training School at the time America joined the world conflict. Mason first saw action against the Jap as a junior deck officer with the Merchant Marine in the South Pacific. Later, he shipped to the Aleutians, where, when his ship was badly damaged, he decided to take an Army Air Forces examination at Seattle, Wash., rather than wait several months while his vessel was being repaired. Before long, he was piloting a B-25. Shortly before shipping overseas, Mason - then a lieutenant - was selected from among a large number of pilots with outstanding ability to undertake a "hazardous mission." This mission was to supply troops trapped by the Japs' abortive effort to invade India from the Imphal Plain. The accomplishment of this task was made the more difficult by raging monsoon rains. The 10th A.F. unit of which Mason was a member evolved a new technique of air dropping that soon became a model for future operations. Mobile squadrons were organized and used extensively during the North Burma campaign to help open the Stilwell Road into China. Flying constantly during these operations, the captain entered another phase of his personal triple-threat war on the enemy when his outfit participated in the superhuman job of moving the British 36th Division into combat. The Tommies were flown to the Myitkyina airstrip while American and Chinese troops thrust back enemy lines only a quarter of a mile away. It was commonplace to land the lumbering transports through enemy fire. It soon became that a man who knew the intricacies of air support was needed to work with the Allied forces pushing southward in Burma. Mason got the job. As squadron air intelligence officer, the captain helped Maj. Gen. Francis W. Festing to plan air-ground strategy. On several occasions, the former FBI agent "buzzed" enemy airfields to photograph disposition of troops and aircraft. In addition to his other duties, Mason led a flight of nine planes in a sweep over enemy territory which resulted in virtual destruction of a Jap battalion. In the course of this global tiff, the Yank G.I. has invigorated belles lettres with a number of colorful words and expressions. Some, we'll admit, have so much muscle that you wouldn't dare repeat them in the presence of your maiden aunt. Others, however, will surely contrive to worm their way into public acceptance. Of these, old Os' is most charmed by the phrase, "snow job." The origin of the phrase is too nebulous for ole Os' to attempt a clear explanation. But if any of you fellow Government Issues have any favorite theories to expound, he'd like to hear from you. Just tear the cover off a box of K-Rations, enclose Rs. 175 for the Fink Benefit Fund, Inc., and dispatch by the first bullock cart pointed in the direction of Delhi. Caution: Don't send the K-Ration. There are any number of types of exponents of the "snow job." Some are quite harmless characters who intend no injury. Such as the guy whose imagination lengthens the size of the fish which slipped off his hook. Even old Os' is not above this sort of "snowing." Do you not dwell in the same glass house? Let's blush for an ephemeral second and pass on to the more obnoxious examples. Called to mind is an authentic story we heard recently about a G.I. leaning nonchalantly against a lamp post at Hollywood and Vine. His arm bore a CBI patch (the neon-light variety) and his chest almost as many decorations as Eisenhower. Our informant, a fellow sufferer in I-B home on TD wasn't wearing his own shoulder patch at the time. "Hello soldier," he greeted the be-ribboned hero. "What patch is that you're wearing?" "Ever hear of CBI?" asked the "snower," cautiously. "Somewhere in the Far East, so I've heard." "Oh, you don't know much about CBI?" With which the guy with the fruit salad, now more confident, launched into a vivid description of how he parachuted into the virgin jungle to help carve out a B-29 field behind Jap lines, jousted with violent head-hunters and oftentimes had to scrounge off the country for weeks. "What did you say your APO was?" Trapped, the "snow" artist blurted, "Oh, it was 465." The G.I. who told old Os' the story related how he bitingly remarked, "How were the steaks at Firpo's?" and walked away with an air of quiet satisfaction. The discomfited "snower" was doing nothing more than either feeding his own ego or trying to cadge a few drinks around a nitery and, though definitely to be quashed in the manner of a house fly, still has more character than another type that is prevalent. Od Os' refers to the version of the "I'll-put-your-name-in-lights-baby" wolf. With the susceptible feminine talent here in Kipling-land, many of whom have drawn their ideas about the U.S. from the cinema, he uses as bait his vast estates, swimming pool, classy yacht and two Lincoln Zephyrs. Chums, old Os' ain't "snowing" you a bit. Similar, better quality image of Angela Greene has been used in this re-creation.